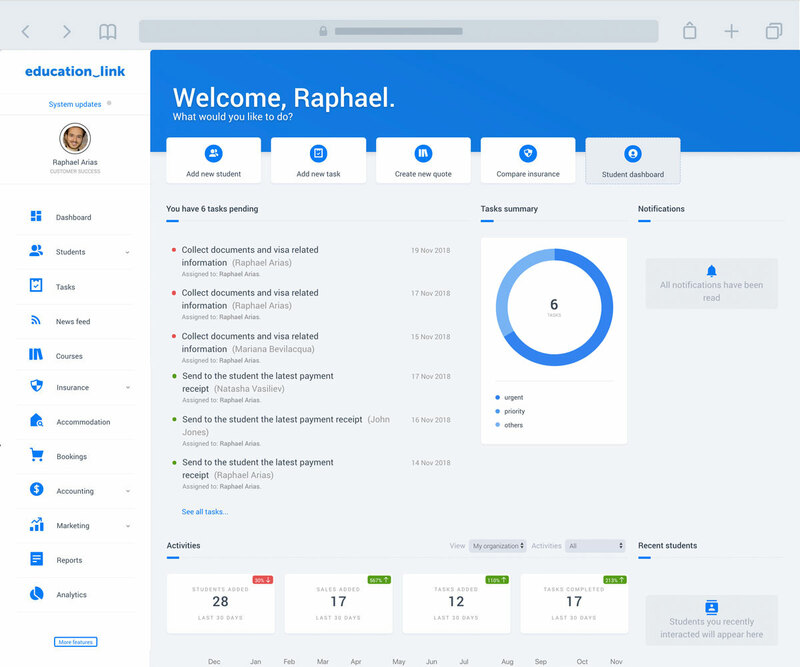 All-in-one education softwareand agency management system. Enroll students, manage commission and send quotes and automate your agency. 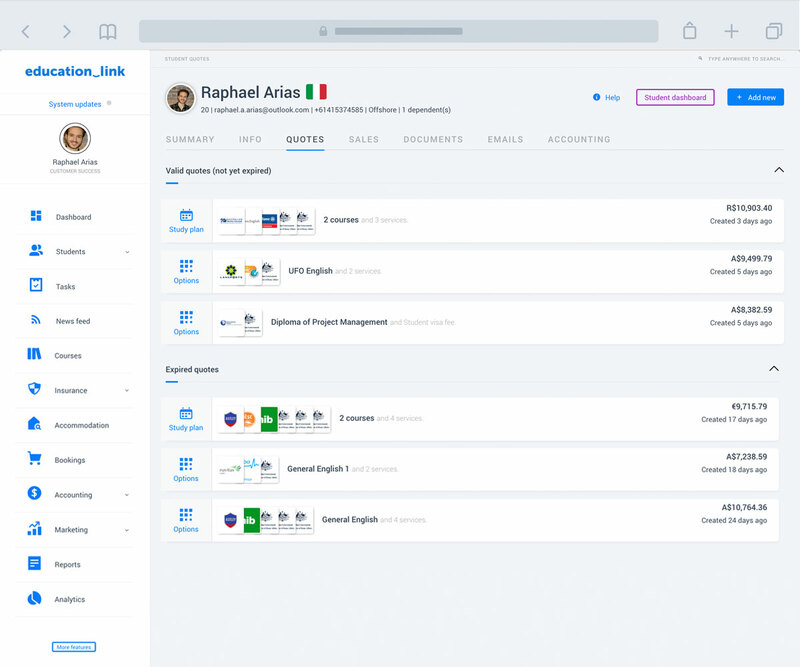 If you wonder which CRM large agencies use, then meet EducationLink. 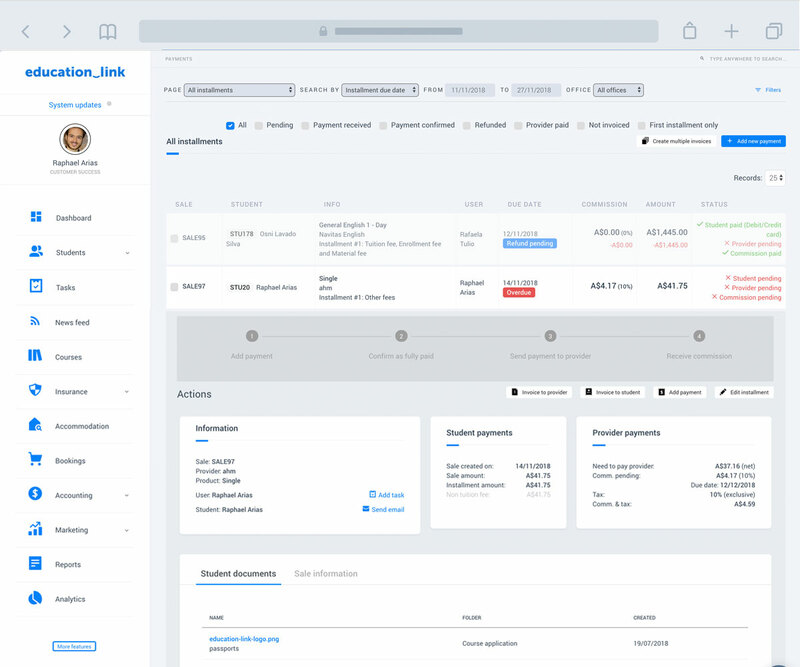 CRM, agency management and student management system in one. EducationLink is used by the biggest agencies in the world and was created to handle everything you ever imagined, and the things you didn't too. An student management system and agency CRM made for the international education sector. Student management system and agency management system fused in one state-of-the-art CRM for the international education industry. Your agency's website now integrated to your education agency management system. 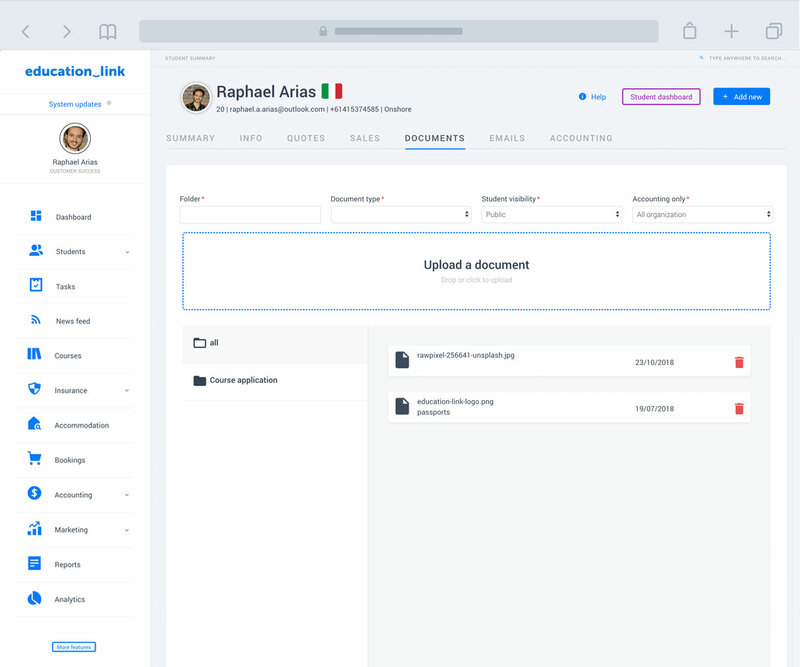 Add leads automatically and free yourself up for more important tasks. Save all your students' emails directly to the agency management system. With no effort at all. Yes, that's EducationLink. Available for Gmail and Office 365. Present courses, insurance, accommodation like never before. You can customize every single detail of your quotes and marketing brochures. 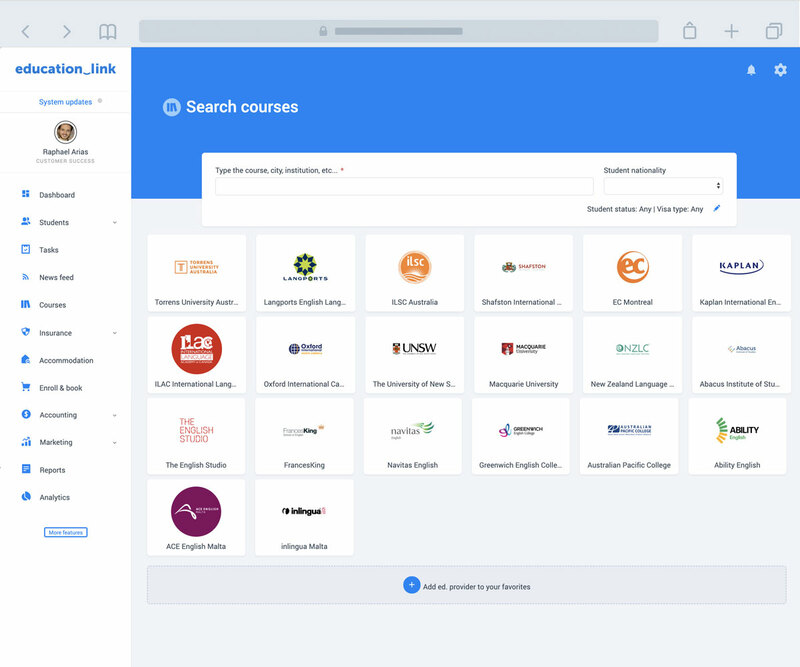 Agencies can search almost 50K courses in more than 3k colleges and universities, generate quotes and then guide the student thought the course enrollment process, insurance and accommodation booking and more. Start the student's application directly in your education management system. No need to go to other systems anymore or send emails. Both your partner colleges and you can update the prices and course information. In any case, we have a team ready to do it for you. Education agency commissioning mastered. Let EducationLink track your commission, student payments, create your invoices and control bonuses from one place. 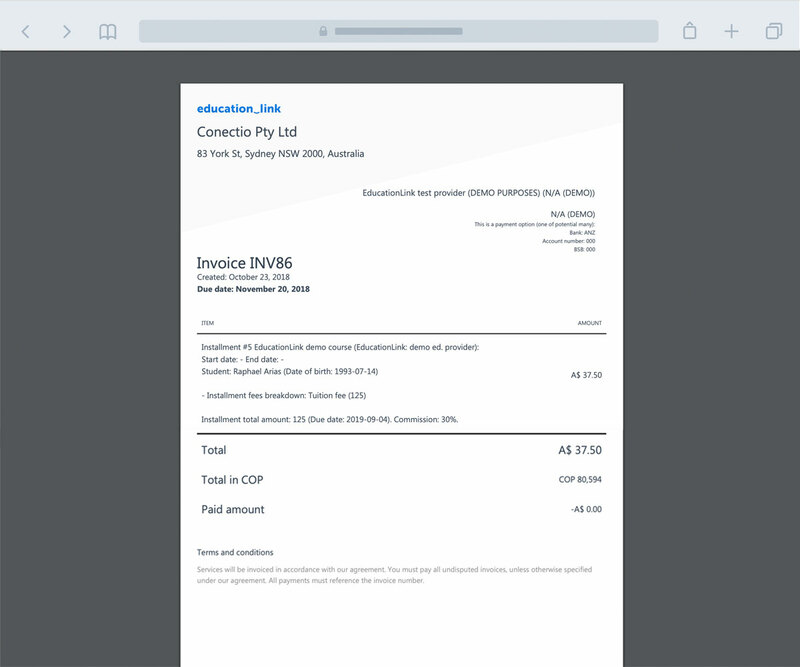 EducationLink is capable of generating your commission invoices automatically. Take the step further by giving them access for full transparency. Integrate with your preferred accounting system. 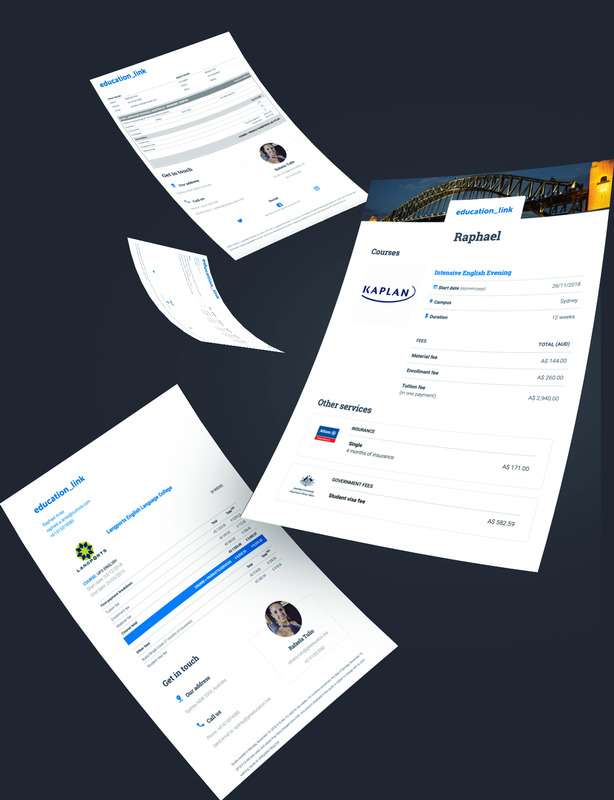 Have your invoices, and payments synced between your accounting software and your agency management system. 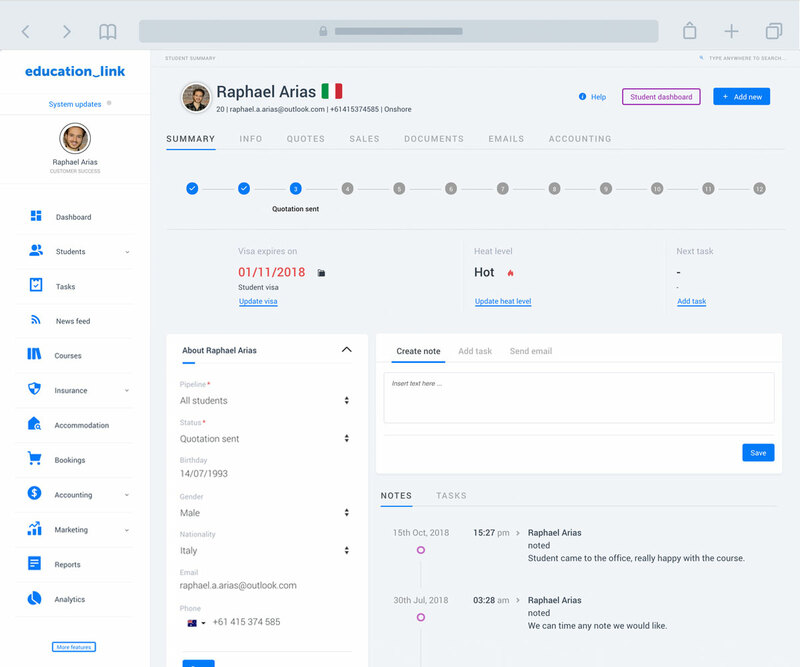 were connected to your CRM? 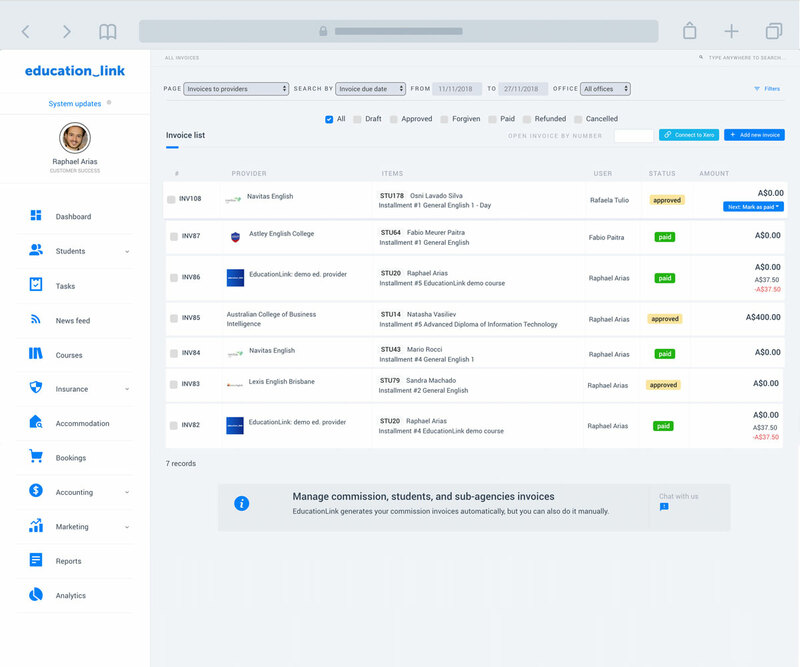 One student CRM, limitless possibilities. 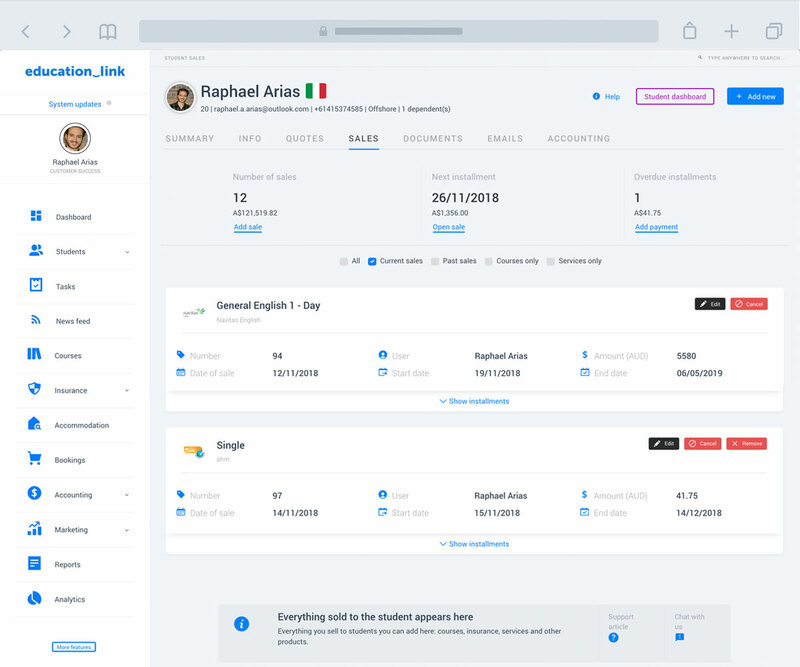 With the agency management system of EducationLink you can integrate seamlessly with your favorite tools such as Mailchimp, Xero, Gmail and more. EducationLink has everything you need to help you run your international education agency or ed. provider no matter the size, from small companies to large enterprises. It's the ultimate agency management system. Small companiesWe've taken care of the special needs of your one person company or small team. Medium sizeSpecial features tailored to help your business establish the foundation to grow faster. Large businessesManage hundreds and thousands of employees and complex highly customizable process with easy. Easy booking and higher commission OSHC. 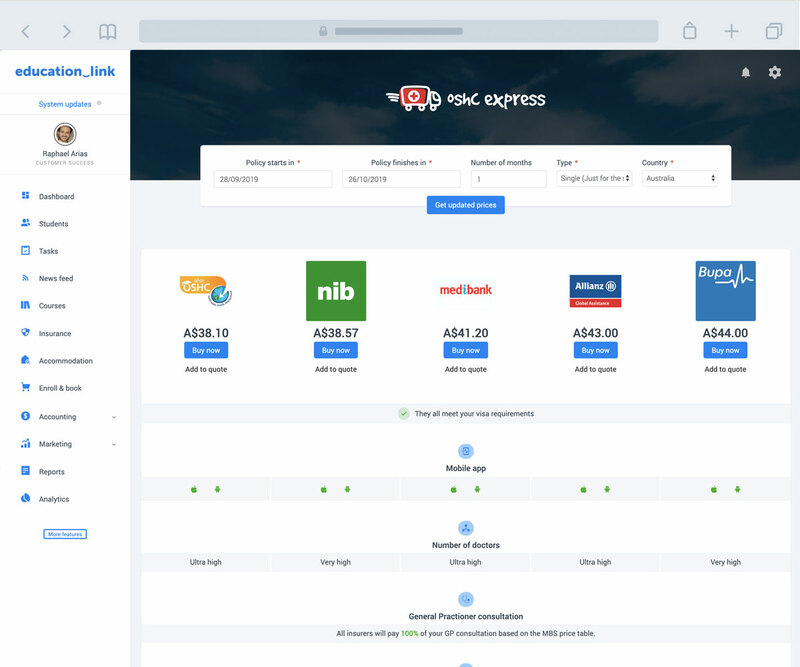 OSHC Express is a simplified way to compare OSHC: Bupa, Allianz, Medibank and others. And you can do everything from EduLink, the all-in-one education agency management. Every business is unique in its needs. EducationLink's team knows everything regarding international education industry and the challenges of running an education agency. We have the most comprehensive software for international education agency of any size and for commission management. Unlimited training via Skype or in-person (when possible) to make sure you feel the value of our agency management system. Let us help you with the best practices of international education industry and international education agencies worldwide. We help you with data migration, setup of your account and guide until you are ready to use EducationLink. Tell us your challenges and goals and we will do our best to help. We have plenty of experience with education agency management and we can help to migrate from your education agency management system.